On this day in 1499, Perkin Warbeck, pretender to the English throne, was hung at Tyburn for treason. He didn’t fare as well as the previous royal pretender, Lambert Simnel, who was pardoned by King Henry VII and made a spit-turner in the royal kitchens. The murder story has never been proven and the princes’ bodies were never identified, leaving a yeasty petri dish for pretenders to grow and multiply — and so they did. Warbeck, who later admitted he was actually born in Tournai, in Flanders, in approximately 1474 (his father is described by one source as “a renegade Jew”) first claimed to be the Duke of York either while at the court of Burgundy in France in 1490, or while serving a silk merchant in Ireland in 1491. 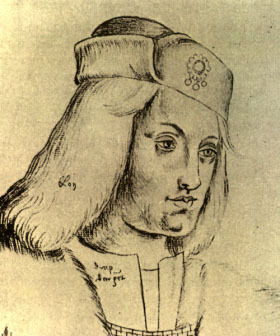 He did bear a strong resemblance to Edward IV, but there is no evidence that he was really Richard of York or that he and the late king were related in any way. Nonetheless, his claim was soon recognized by Charles VIII, King of France … and it naturally appealed to the fledgling Tudor dynasty’s potential internal rivals, too. Margaret of Burgundy, who was Edward IV’s sister and the disappeared Duke of York’s aunt, was one of these educated the pretender about “his” history and the ways of the English court, and she helped finance Warbeck’s attempted conquest of England in 1495. It went badly from the beginning: Warbeck’s army was trounced and 150 of his troops were killed on the beach in Kent before he even made it ashore. Warbeck fled to Ireland and then Scotland. Warbeck had more success in his second invasion attempt, in Cornwall in 1497 on the heels of the Cornish Rebellion. Warbeck promised an end to the exorbitant taxes levied on the citizenry, which welcomed both pretender and promise with open arms. His army grew to 6,000 or 7,000 men, and Warbeck began calling himself Richard IV of England, but when he found out King Henry was after him he panicked and deserted his men. The execution was not until 1499, and only after it was alleged that Warbeck tried to escape with a real royal claimant, Edward Plantagenet, Earl of Warwick. On November 23, Warbeck was taken from the Tower to Tyburn, where he read out a confession and was hanged. His wife, Lady Catherine Gordon, a cousin of the King of Scotland, had a better fate; she was given a pension and a job of lady-in-waiting to the Queen. At least she didn’t have to turn a kitchen spit. I read an article that stated the present Queen and church advisors won’t get the bones DNA tested. They don’t want to start a precedent and argued that they would not know what to do with the bones if they turned out not to be the princes. As far as I know it was never actually 100% proven those bones were theirs — at the time they were located, nobody had any way to prove it. I don’t know what happened to the bones, and if they could DNA test them now. Lots of people here arguing that the princes in the tower perhaps escaped one or both. That woukd be fine except no one mentions their bodies were actually found. I despair of the “conspiracy” school of history! Both Princes were no longer seen after October 1483. Both Domenico Mancino and the Croyland Continuator ( who certainly had privileged information) wrote about this at the time and it was openly said on the London streets that the Princes were dead. They were never seen after that date. Young Richard was in the Tower with his brother Edward and Elizabeth Woodville was not in a position to send him any where. She was in fear of her life and for those of her children. Elizabeth Woodville had spent deal of time in sanctuary, and in fear of her life and the lives of her children.Do you seriously think that she would have given her youngest child up to Richard III knowing how he was ridding himself of all possible claimants. More likely that she sent him to safety in Flanders masquerading as a mere peasant to hide him in plain site to make his claim at a later date. I apologize for any typos that slipped by the editing process in the publication of To Know Lion by His Claws but the above does not seem to be exempt from typos either. In addition, reading the remaining 40% of the book might answer some of your questions regarding my theory that Edward V became Erasmus of Rotterdam. Because this theory is startling different than any presented so far, I realize that it will meet with resistance. However, as Erasmus says, ‘the proof is in the pudding’. If one studiously researches Erasmus personal life, the facts are there to raise questions such as; Why was Sir Thomas More so close to Erasmus? Why were Erasmus and Perkin Warbeck surrounded by Englishmen on the continent? Why was the Bishop of Cambrai intimately involved in both of their lives? Why did Erasmus have a ceremony for himself at Westminster absolving him of a blemished childhood? Why did Erasmus write Education of a Christian Prince? Why did More warn Erasmus about his questionable writings and persecute Tyndale at the same time? And further, is it just another coincidence that the stone bearing the name Erasmus in Westminster today above the door leading to the urn holding the princes’ bones is the same one that was above the original entrance to a chapel built by Elizabeth Woodville commemorating the safe birth of her son Edward in 1470? These are valid questions seeking researched answers. By the way, I never said that Edward was John Clements. That is some one else’s theory, not mine. Having read 60% of this book, I am struck by the number of typos and sheer inaccuracy. Eg, James V of Scotland, son of Mary Tudor did NOT unite England and Scotland. There is a portrait of Erasmus by Holbein on line so why all the mystery about gonig to Old Hall? I am a member of the Richard III Soc and feel there are other explanations of the prince’ disappearances. It has been said before that Wrbeck almost certainly was Richard but Edward can’t have been Erasmus and John Clements, More’s son in law, which is another theory. Interesting though that More links both theories when his account of R III is so damning. Badders raises a question I have asked to no avail; where was Granny Cecily Neville in all this? You should try reading authentic sources before inventing vague theories. There are a lot of them out there, including Polydore Vergil and the Venetian ambassador of the time, both of whom firmly believed the Princes were dead by autumn 1485, as did those who were political informed in London. Just because Josephine Tey wrote a novel in the 1950’s and stirred up a lot of woolly-minded thinkers, amongst whom are the Richard III Society, does not make him innocent. Edward 1V and Richard III were both over-mighty subjects, as was the Duke of Buckingham at that time. They all wanted to be King and Edward had Henry VI murdered to stop him being a rallying point. Richard was not king but Protector, and then suddenly he was king. He must have known there was no-one who could contradict him. He was a pugnacious and bloody-thirsty young man and was the same as he aged. What I continually find interesting is that so many people believe in Richard III’s guilt when their evidence is just from other people’s thoughts, ideas, suggestions, etc. None of us were there. Why is a King thought of as over-mighty just because they were born of royalty? Weren’t they also people with individual personality traits, hearts, and concerns for caring for their subjects and realm. Richard III, as stated before was trying to protect England from an invasion from France. That is real history. His scholarly nephew may not have taken as tough a stance against the invaders that was necessary to protect England and that worried Richard greatly because of his recent discussions with his brother, the king, Edward IV, in the winter of 1483. Because the princes disappeared (and no-one knows how) that does not mean that he murdered them but it does mean that he may have known what happened to them. I am offering the suggestion that Richard sent them overseas as many rumors of that time suggested and that the princes lived but had to give up their royal position. Isn’t that a viable theory when no-one has yet proved beyond a reasonable doubt otherwise? To defend himself from the charges of being a child murderer! He could then have returned them to the Tower. Elizabeth Woodville refused to let Elizabeth of York after Anne Neville died. She allowed Henry VII to marry her. She knew her sons were dead and who had killed them. As for Richard III – it was the late Middle Ages and just before the Renaissance. How did over-mighty subjects and kings treat those in their way? Yes, they killed them. I have a question for Fiz. Why would Richard want to produce the princes when he knew he had to defend England against Henry Tudor and France? The populace knew that Edward V was legally king and that would bring into play the Woodville etc. who might not be as focused on a military reaction to France. What must be remembered is that Richard had just spent the winter with the king discussing the upcoming war with France. As was well known, Edward V was not inclined towards combat but Richard III was a seasoned commander. AND – Edward IV did name him protectorate of the realm until Edward was 14. Meagan, I am with you. The rumours about the princes having disappeared was heard throughout London from 1483 onward. If they had been alive, Richard would have just had to produce them to deny the rumours. He couldn’t, because they were dead. I’m a historian, not a conspiracy theorist. Sarah, have you read Jan Bondeson’s The Great Pretenders? You might like it. In response to the reply above – I really think that it was Richard’s intention to just hide the princes for a while until he settled with Henry Tudor. Remember that Tudor was increasing his forces in France and planning an attack all during Richard’s short reign. Richard had the safety of the whole realm on his shoulders as Protectorate. And – if he sent them to safety in the lowlands, which also was rumored at that time – he knew that he could bring them back later. Just a thought. Check out the website http://www.princesinthetower.com. For some reason the whole “did Richard III kill the Princes” thing has always gotten people at each other’s throats. I would just like to point out that the Princes were conspicuous by their absence — if Richard had NOT killed them, you’d think that in response to all the stories that he had, he would have produced them in public to prove his innocence. Yes, someone was hung at Tyburn on this date, but how do we know exactly who that person was? Henry VII had a problem to be sure. The bodies of the assumed dead princes were never found so their alleged death was none other than one of many rumors floating around London at that time. It seems that Henry truly feared an uprising – not because he had a firm hold onto the throne, but because he kept being haunted, like his son, Henry VIII, by the whereabouts of the missing princes. Historians can only truly divulge that the princes disappeared – not that they were murdered. So, any studious person seeking the truth should look at all possibilities until the most obvious reveals its secret. My website shows that another version of that fascinating mystery might answer the riddle as to what happened to the famous princes of Edward IV.